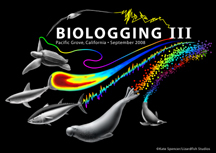 The Third International Biologging Science Symposium will take place over the course of five days. The meeting will start with lunch at 12:00 p.m. on Monday, September 1, 2008 and will end at 12:00 p.m. on Friday, September 5, 2008. 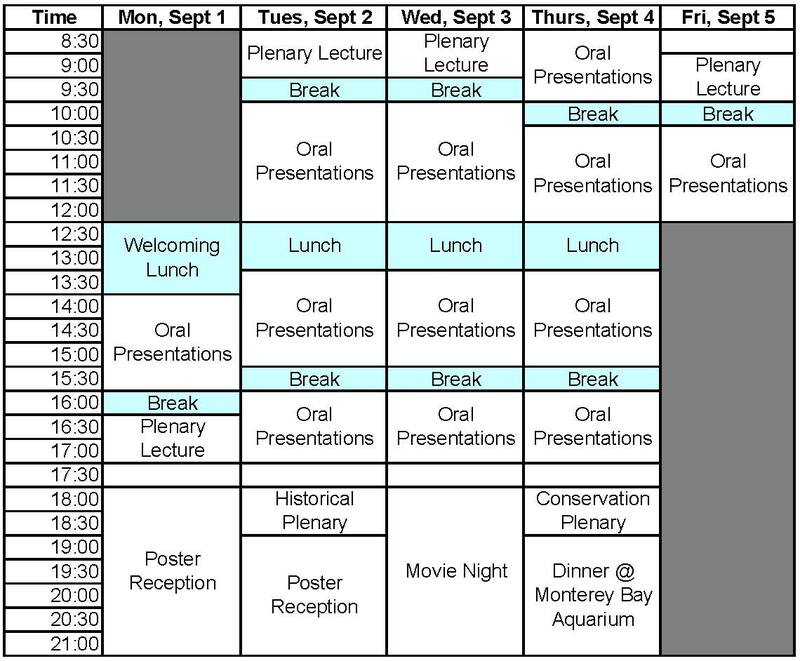 Click here to view a larger version of the DRAFT symposium timetable. Biologging and Climate Change: Global climate change will impact the distribution, behavior, and demographics of marine megafauna. This session focuses on how biologging can provide valuable insights to study the impact of climate change on marine organisms. Monitoring Organismal Physiology: New generations of biologging technology have revolutionized physiological studies of marine animals at large in the wild blue ocean. 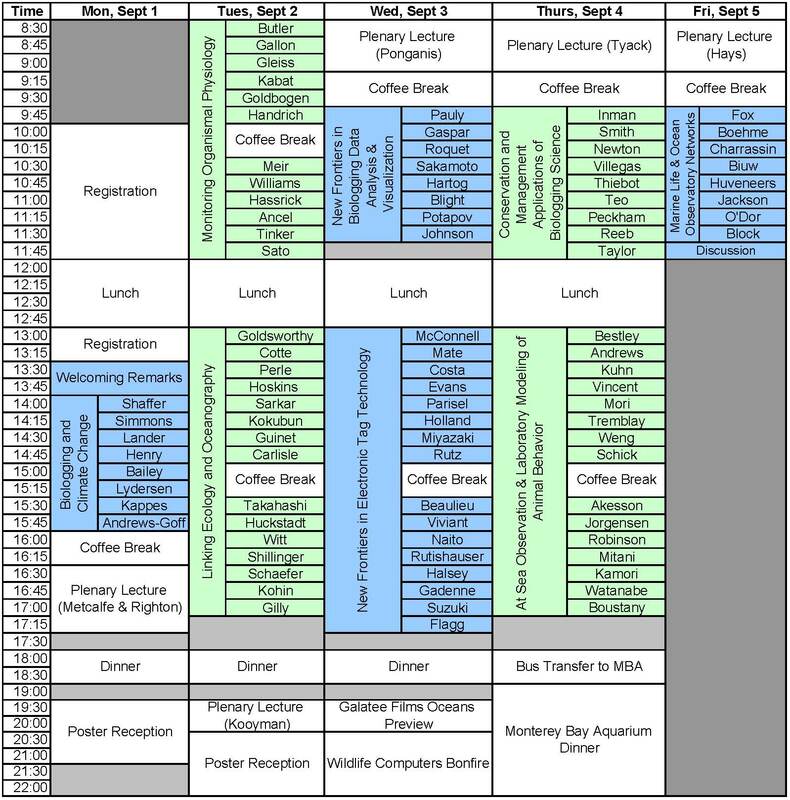 This session focuses on the methodology and results of using electronic tag technology to study the physiology of marine mammals, fish, and birds. Linking Ecology and Oceanography: Increasing sophistication of biologging and remote environmental sensing has improved our understanding of the linkages between ecology of marine species and oceanography. This session focuses on relationships between ecology of marine wildlife and their oceanic environment as revealed by biologging investigations. New Frontiers in Biologging Data Analysis & Visualization: Advances in biologging have increased the data retention and lifespan of electronic tags, resulting in tens of thousands of data points in long-term studies. New techniques for analyzing and displaying biologging data have emerged, increasing the knowledge gleaned from tagging and scientists’ ability to communicate the results. New Frontiers in Electronic Tag Technology: Biologging technology has revolutionized the way we study animals. This session will focus on the latest biologging technology and ongoing tag development research, with an emphasis on the applications and improvements of new technology. Conservation and Management Applications of Biologging Science: Data gleaned through biologging research can improve conservation and species management by assisting bycatch reduction strategies, spatial management techniques, population assessments, and climate change mitigation. This session will focus on case studies where biologging data have been (or can be) incorporated into conservation or management programs. At Sea Observation & Laboratory Modeling of Animal Behavior: Modeling behavior and habitat use of marine animals can be studied by combining animal location with environmental data. This session focuses on the structure, inputs, and outputs of static and dynamic models of animal behavior based on biologging data. 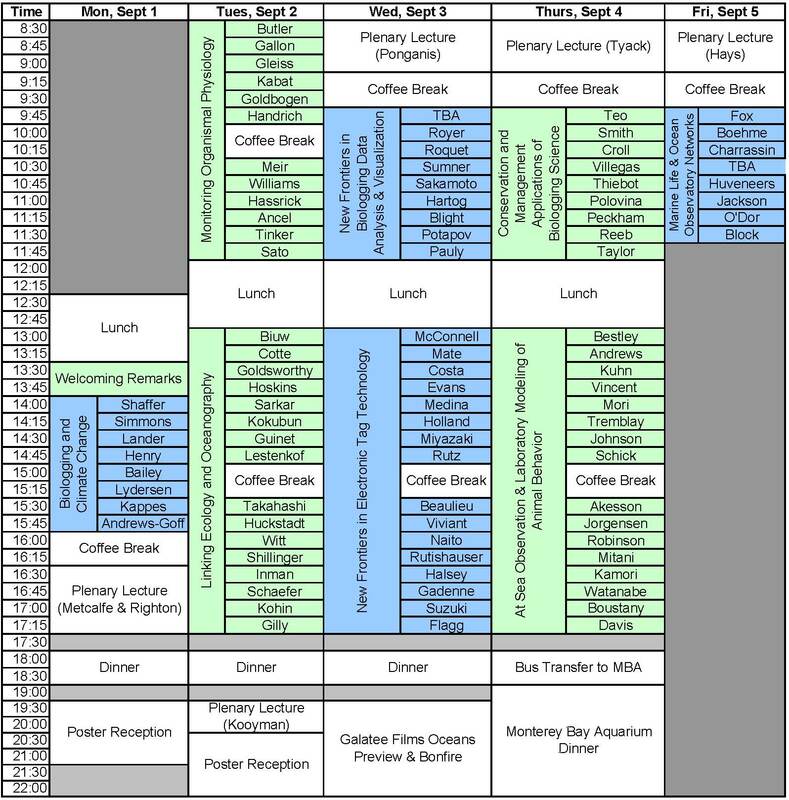 Marine Life & Ocean Observatory Networks: Marine biological research is rapidly evolving toward integrated ecosystem approaches through marine life ocean observation networks. This session will focus on results from extant large scale programs and existing observatory networks, new opportunities and challenges for future broad-based scientific partnerships.